Alright, I usually have nothing I can release on C3. But this time, I have something. 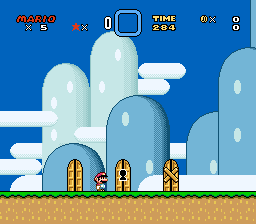 Yes, I have recreated SMW's doors almost identically in sprite format and also have added more functions. The first thing is that each door can have a different look i.e. you can have them set to be either small, medium sized, large and a boss door. Save for the boss door, they even behave similarily to how they acts like with Yoshi i.e. 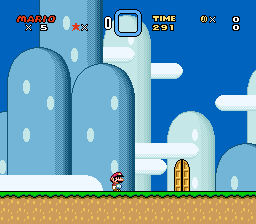 small doors doesn't let Yoshi in, medium doors only when Mario is small and large doors always let Yoshi in. The only exception are boss doors because curiously Yoshi can't enter boss doors at all (even when small) due to how the door interaction and boss door work. I still made them enterable because it makes IMO more sense that way. See the ASM file for more deails. Each door also can be locked or even blocked. The doors also can be set to remember whether they were entered or not. This means, you can either set doors to remember that they were unlocked or whether they can be used only once. 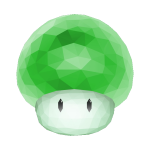 Uses the item memory (think of how the game remembers collected coins) or some freeRAM. The appearance like P-switch only doors also exist. Other switches exist too including silver P or On/Off switch. 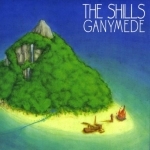 The destination can be set either like how SMW handels it or it's handeled by the doors themselves. You can also make it so that a key has to match the door's palette (inspired by imamelia's door sprite in Tessera). I'll work on a coloured key spawner later. 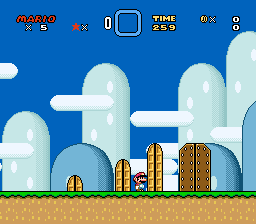 There are some glitches like it doesn't handel carried sprites correctly (in part because I also imitate the teleport code) or that the fixed teleport destination has some problems too. Block interaction is gltichy too. These coins are invisible until you collect them later. I made them sprite because they were build that way and might do a block version later. For now, they're purely sprites. The amount of coins they give and their position is also customisable. .. with a shell as a bullet! You're not safe even on ground! Oh yeah, it is now possible to put shells into a bullet bill cannon. Originally from my scrapped KLDC level, I now made them public to use. Okay, I lied. It always was possible to put shells into cannons (and is quite simple to do so) so but there was no known shell shooter so the only option was to code on yourself. It is possible to use Erik's kicked Koopa shell like VERY VANILLA CALAMITOUS CAT CANNON CANYON CAKEWALK, second place from CLDC 2018, did it, though it's more of a hack because it's supposed to replicate run once "sprites" (also a hack in a certain way) and not to be put in shooters (though unlike the empty shells, the kicked shells sprite are actual sprites even before they get transformed into the actual shells). The KLDC fact and that it's public to use is true, though. and whether the shooter shoots closely to Mario or not. This is more of a notification than a big news (hence the lack of a screenshot) but in the following GIEPY remoderation I am going to enhance some sprites of which my midway point was the first to get (publically) enhanced and do so with some other sprites (especially these which I had remoderated). This version of the midway point has added multiple midway point compatibility, btw, so even for this thread, it is still quite minor. I know this isn't much as I generally haven't got many resources to release on C3 but I at least want to contribute this time, even with minor stuff. These look really practical which is awesome. The shell shooter is surprising that is has not really been done before in this way. I can definitely see myself using it. Always liked idea of transforming blocks into sprites! Nice job! Not sure how those popping out coins work, they look like they spawn at random positions near the main sprite. Still looks good. This will be very handy, because not many users know about "run-once" thingy. Overall good job on those resources! Midpoint update sounds promising too! I did not realize I needed a shell shooter or invisible coins in my hack, but I absolutely do. Excellent work, Not Mario! 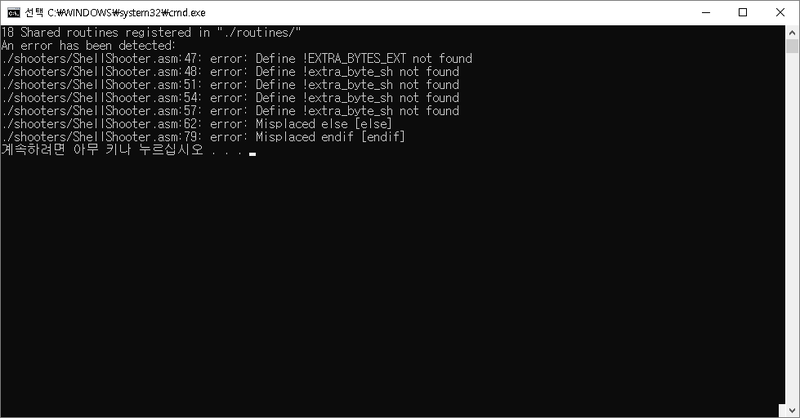 I'm sorry to ask you a simple question, but I keep getting an error. Mod edit: Fixed table stretch from the image. Based on the errors, the sprite you're trying to use is a shooter for GIEPY. You can find GIEPY here (the latest release is 1.0.2) and see its instructions here. Of course, keep in mind you can't use both on the same ROM. It's probably best to wait until the site-wide switch to GIEPY before using it. There are currently some issues with our hosted resources which need to be fixed. Thank you, it's been solved thanks to you.